Jamey J. Lister has been an assistant professor at WSU School of Social Work since 2015. 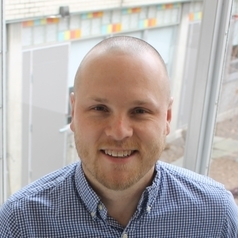 Dr. Lister's interdisciplinary research focuses on improving access to evidence-based treatments for people with opioid use disorder [OUD] and other addictive behaviors. His projects examine psychosocial and clinical factors that influence treatment outcomes across low-income rural and urban communities. Jamey aims to create translatable knowledge that aids in the development and implementation of innovative approaches to address barriers to addiction treatment. The U.S. Fulbright Program and Wayne State University initiatives have supported Dr. Lister's investigator-initiated studies. He is part of the State of Michigan Targeted Response to the Opioid Crisis Grant (funded to the Department of Health and Human Services by SAMHSA) and colloborates with telemedicine addiction programs. Jamey is adjunct faculty at WSU School of Medicine, where he completed a postdoctoral fellowship. He earned his PhD from Rutgers University and collected his dissertation data at Carleton University in Canada. Dr. Lister's research has been published in peer-reviewed journals in addiction, social work, and psychiatry, and his work has been disseminated in leading media outlets (NPR, CNBC).